The hot tub and spa Grit Gitter is the underwater vacuum powered by you! The Grit Gitter is the solution for quick spot cleaning in any hot tub or spa! Simply grab the Grit Gitter, place it over the debris, squeeze, and you are done! It is that easy! 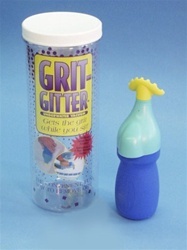 along with a fun product design, the Grit Gitter is the product of engineering ingenuity! Great for vacuuming grit and debris from tight corners, the Grit Gitter floats on the surface of the water until you need it. There’s nothing to get out, nothing to hook up, or anything to plug in, you just grab it and go! It’s so much fun you will have to wait your turn to use it! For a quick, fun cleaning experience, make your hot tub and spa maintenance easy with the Grit Gitter! From Rachel of Middlefield, Connecticut on 7/12/2015 .